The European Commission funded G8WAY project is researching educational transitions with he aim of using social software and web 2.0 to assist young people in transitions. As part of the methodology the project has undertaken some 50 interviews in five countries looking at how young people move from school to university or work, and from university to work. These provide a rich, of somewhat disturbing, picture of uncertainty in an increasingly complex world. But, in terms of designing social software 50 case studies are hard to handle. The project has developed three personas or archetypes to help in this process. I proudly present to you the determined, the meanderer and the stagnant. The determined person tends to have a very supportive family or peer group who are able to provide encouragement and emotional security to the individual. With this in place the Determined person is able to make bold and confident decisions in their choice of career. These decisions are often made early in the individuals lives allowing them to follow a clearly defined progression towards their objective. The determined person knows where he/she is heading and rarely ventures far from the path. The truly Determined will always find a way to balance their families’ expectations with their own needs without compromising their goals. Pathways are predetermined and clear. The determined person knows what to do in order to get to the next stage. Career paths are well researched and often, little time is wasted, these are the most efficient of transitions. The Determined are passionate people, they are intrinsically motivated and confident in their own abilities. They have strong friendship groups and take advantage of networking opportunities. They use their initiative and they think things through carefully rather than acting on impulse. Determined people use support services well, they make use of the internet, social networking, careers guidance services and mentors. They are likely to seek out and take advice from those with more experience. Determineds make good use of the internet by surfing web sites to search for information, using email, participating in online forums and using social networks to keep in touch with friends. Meanderers tend to have very wide social networks making friends easily with contacts from diverse sections of society. They receive a good level of support from family and peers but lack clear guidance. Family ideals can often be a barrier to their progress. Meanderers may have multiple goals, never being entirely sure which one to pursue, or they may have one fixed goal but be unsure which path to take in order to achieve it. Some meanderers think that their dream is beyond their reach. The direction is uncertain and several different pathways are attempted. There are indirections and distractions along the way such as social or financial pressures. The meanderer tends to eventually reach a satisfying position but often takes the “scenic route”. The meanderer collects qualifications and enjoys learning even though the process may not directly benefit their cause. They tend to have plenty of work experience mostly around their area of interest and may have tried their hand at a number of related jobs. If meanderers use support services, they make use of the internet, social networking, careers guidance services and mentors but do so without a clearly defined pathway. They have difficulty with filtering out the useful information or deciding what to do when given conflicting advice. ICT is used by this group but more for pleasure, social networking and games than for careers guidance. In the interviews, the young people typical of the group often describe themselves as not being ICT experts suggesting a lack of confidence. provide a sharing platform for people in transition. report the different experiences for different age groups. The Stagnant group representatives have low levels of support from family and peers. They have no fixed direction and are often too caught up in the challenges of the here and now to contemplate the future. By definition this group is rather unmoving or moving at pressure (financial, social). They may have some academic background but tend to be early school leavers with little desire to undergo further education. The Stagnant group are not usually actively following a clear path towards a desirable position but are happy to have reach any professional status. If further education is attempted, it is used as an interim solution. Steps taken are by chance rather than design. External proposals are taken up readily. Social and financial pressure is often the motivator to get active. Own professional plans often lack sound reflection against the own abilities and resources. Learning takes place rather accidental and informal. Individuals typical of this group may attend youth groups or be involved with other community programmes. They also call on known professional services but often struggle to find specific services appropriate to their needs. The group members tend to be familiar with search engines, email and some social web2.0 tools. Multiple, extended and indirect transitions that are described to be distinct features of the Meandering persona are becoming increasingly characteristic for modern transition pathways. In our case samples, they showed throughout all transition types. First a warning. This is the beginning of an idea but by no means fully tho0ught out.It comes from a discussion with Jenny Hughes last week, when we were talking about the future direction of work on Personal Learning Environments. The first – intra-personal – describes the spaces we use to work on our own. This includes the different software we use and the different physical spaces we work in. It is possibel that our intra personal spaces will look quite different – reflecting both our ways of thinking and our preferred ways of working. one interesting aspect of the intra personal learning environment is the importance of aesthetics – including the look and ‘feel’ of the environment. And whilst many of the3 developers I work with undertake usability standards, I do not think they really ever consider aesthetics. The third dimension – extra personal – refers to the things we do out in the web – to our publications, to blogs like this, to the videos we post – to the things we share with others. But perhaps the most interesting is dimension is the intra-personal learning environment. This is the shared spaces we use to collaborate and work with others. All too often such spaces are imposed – by teachers or by project coordinators or those responsible for web site development. And all too often they fail – because users have no ownership of those spaces. In other words the spaces are not seen or felt of as part of a PLE. How can this be overcome? Quite simply the inter-personal space needs to be negotiated – to develop spaces and ways of working that everyone can feel comfortable with. Of course this may mean compromises but it is through the process of negotiation that such compromises will emerge. The problem may be that the PLE has come to be overly associated with personalisation rather than negotiation and ownership and too little attention has been paid to collaboration and social learning. I think it would also be interesting to look at how ideas and knowledge emerge – or as the Mature project would say – how Knowledge matures. In developing ideas and knowledge I suspect we use all three dimensions of our Personal Learning Environment – with new ideas emerging say from reading something in the extra PLE, moving ideas back to the intra PLE for thinking and working and developing and then sharing and working with others in the (negotiated) inter Personal Learning Environment. Of course in practice it will be more complex than this. But i would like to see how these processes work in the real world – although I suspect it would be a methodologically challenging piece of research to carry out. Anyone any ideas? Last weekend I spoke at the #TICEDUCA2010 conference in Lisbon, Portugal about PLEs. I greatly enjoyed myself and even may have developed a couple of new ideas (more on this later this week). But first a few impressions. I have to say this is a very subjective viewpoint as only the keynote sessions – mine and Helen Barrett’s were interpreted. Having said this, I had the perfect excuse to hang around the coffee bar and ended up having many fasci9ntaing conversations – some of which I am now continuing by email. Firstly something about the composition of th3e conference. from a quick straw poll it appeared a majority of the participants were teachers. Thus many of the discussions I had were closely related to the practice of teaching and learning. And there was certainly great interest in the idea of PLEs, even if there was some confusion about how exactly a Personal Learning environment differed from say Moodle. Most of the teachers I talked to were enthusiastic about the potential of using technology for teaching and earning. This may to some extent due to the Portuguese policy of providing subsidised laptops and broadband connections for teachers, school children, and adult learners.According to Dan Tapscott nearly nine out of 10 students in Grades 1 to 4 now have a laptop on their desk. Don also points out that there has been heavy investment in teacher training to use the technologies for teaching and learning and I found teachers ready and eager to discuss pedagogic approaches. Having said that, some pointed out to a continuing gap between the policy aspiration and the reality, especially when it came to how the computers were being used. Many of those I spoke to saw PLEs as a fresh approach, particularly for linking learning in school with informal learning outside the institution. Yet the issues and barriers were only too familiar. How do we motivate students who may be disillusioned and disengaged with schools and formal education? How do we develop a more expansive enquiry based pedagogy whilst at the same time delivering a prescribed and more limited curriculum? How can we develop collaborative learning whilst meeting assessment regulations focusing on individual competence? None of these questions are new. But it is encouraging that so many teachers are engaging with these questions. I came away impressed with so many ideas from researchers and teachers I was lucky enough to talk to – but still wondering how we can harness their ideas to make change happen? A quick summary of some of the recent research on mobile learning. Mobile devices are becoming ever more important due in main to their ubiquity. The number of mobile phone subscribers will increase to five billion people this year thanks to the growth of smartphones in developed nations and mobile services in poor nations, according to the United Nations (2010). Industry predictions are that the sales of smart phones, able to access internet services, will surpass that of ;ordinary’ mobile phones by March, 2011. Added to this is the rapid development and take up of all kinds of different mobile devices, ranging from tablets such as the iPad and book readers such as the Kindle. “The past decade has witnessed two revolutions in comunication technology. The first — the Internet revolution — has changed everything in higher education. The second — the mobile phone revolution — has changed nothing. We’re vaguely aware that our students have mobile phones (and annoyed when they forget to turn them off in class), but it hasn’t occurred to us that the fact they have these devices might have anything to do with our effort to provide them with educational experiences and services. The definition and scope of mobile learning is central to the debate over the pedagogic use of such devices. The London Mobile Learning Group (LMLG) have been working on conceptualising pedagogies for mobile learning. The London Mobile Learning group have developed the idea of a “social-cultural ecology of mobile devices” based on the triangular relationship between structures, cultural practices ad the agency within which they conceptualise the use of mobile devices. Socio-semantic tools including language, material artefacts and technology mediate the actions of learners as they seek to augment their conceptual resources. according them full recognition in their position and achievements in their lives; as well as of their position as learners and makers of knowledge. In this context,learning means being mobile, being able to change. Reporting on a symposium on m-learning, Laurillard (2007) reports Geoff Stead as arguing that mobile learning is important for access, personalisation, engagement and inclusion providing learners with control over learning, ownership, and the ability to demand things, and thus meeting the rights of the learner. Naeve (2005) points to the ability of mobile learning to support more learner centric interest oriented and knowledge pulling types of learning architectures. The traditional educational architectures are based on teacher-centric, curriculum-oriented, knowledge-push. The new demands are largely concerned with a shift along all of these. (Naeve, 2010). Diana Laurillard (2007) has highlighted the mobility of digital technologies in providing “opportunities for new forms of learning because they change the nature of the physical relations between teachers, learners, and the objects of learning.” (p1). fluid space – learners, relations, and the object of learning. At a practical level there are many discussions, often in social media such as community web sites or blogs suggesting how mobile devices can be used in teaching and learning (see for example Hughes, (2010, a). Hughes (2010, b) also provides a useful summary of the arguments for and against the use of mobile devices in the classroom. There is a growing body of research over the use of mobile devices for work based learning. Sharples et al, (2005) say “Just as learning is now regarded as a situated and collaborative activity (Brown, Collins, & Duguid, 1989), occurring wherever people, individually or collectively, have problems to solve or knowledge to share, so mobile networked technology enables people to communicate regardless of their location.” (p5). Winters, (2007) points to the potential of mobile devices for learning in the workplace to: enable knowledge building by learners in different contexts. and to enable learners to construct understandings. Mobile technology, he says often changes the pattern of learning and work activity. Naeve (2010) also points out that mobile devices can link learning to knowledge management. “At the same time, within most organisations, new demands are being placed on effective and efficient knowledge management. Promoting the creation and sharing of knowledge in order to assure the right person with the right knowledge in the right place at the right time for the right cost is the overall aim of these demands.” (Naeve, 2010). Attwell (2010) has pointed to the potential of mobile devices for developmental learning in the workplace. This allows the bringing together of learning from different context and domains, including the informal learning which is developed through work processes. He outlines the design of a “Work Based Mobile Learning Environment” (WoMBLE). Perhaps the greatest impact of mobile devices may be in changing the relationship between institutional or classroom based learning and learning in a wider society. Steve Wheeler, in his presentation on Web 3.0. The Way Forward? (2010) says that whilst in the past we have brought the world into the classroom in the future we will bring the classroom into the world. Kolb, L. (2010). From Toy to Tool: Cell Phones in Learning. http://www.cellphonesinlearning.com/. Livingston, A. (2009). The Revolution No One Noticed: Mobile Phones and Multimobile Services in Higher Education. Educause Quarterly, 32(1). Pachler, N., Bachmair, B., & Cook, J. (2010). Mobile Learning. Structures, Agency, Practices. New York USA: Springer. Graham and I have just got back to Germany after a meeting of the Politics project team in Cardiff. We were following Wednesday’s demonstrations against the proposed hike in university fees live on TV at Cardiff airport – both of us getting very excited and cheering a lot. The occupation of the Conservative Party headquarters in London was an impressive piece of collective action so to all those involved in the organisation and to all those that turned up on the day, a message of support from Pontydysgu! However, it did make me wonder how we ever used to do all this without mobile phones, computers or social networking media. Apart from using print media, I seem to remember a lot of organising time spent in public telephone boxes pressing button A and button B. In fact, one of my early ICT competences was learning how to tap the receiver rest up and down to mimic the operation of the dial in order to save the 4d (less than 2p) it cost. What are Educational Institutions for? I don’t normally post press releases on this blog. But I think the ideas in this preview of the keynote presentation at the forthcoming UK Jisc online conference is important and deserves wider dissemination. The text is based on a podcast which can be found on the Jisc web site. “We need to re-engage civil society in a debate about educational purpose. These are the powerful words of Professor Keri Facer, keynote speaker at the forthcoming JISC innovating e-learning conference. According to her, we need to stop using qualifications as a proxy for a debate about educational success – “how many people need to get up to Level Two skills, how many people need degrees” – and instead start really thinking about the competencies, skills and attributes students may need to thrive in uncertain times. In the context of the row over HE funding the UK has neglected the fundamental question about what institutions are for and instead has focused simply on the issue about how to pay for universities as they currently exist. Facer puts this in the context of the uncontested idea of the knowledge economy which has dominated the discussions about the future of socio-technological change. “For me the critical issue is that we have been working with one idea of the future for nearly twenty years. The idea of the knowledge economy seems to imply that if only we make sure everybody is educated enough and ensure that they have enough technological skills then we will have a future where everybody will be economically secure. I think this is contestable when we look at some of the economical and environmental developments that are likely to come about in the next ten years. If we look carefully at the lived reality of a future ‘knowledge economy’, for example, it may be one of radical polarisation, inequality and injustice. This is not necessarily an empowering future. As educators we need to start thinking about the other sorts of futures we may want to support our students to create and inhabit.” Facer encourages the audience to start imagining different futures and to examine the kinds of future lives that are offered by this widespread discourse of the knowledge economy. 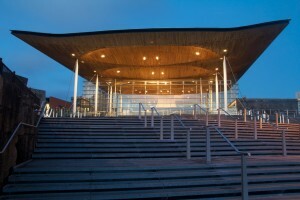 I have been in Cardiff for the last three days, attending a workshop organised by the EU funded Politics project. Pontydysgu are a partner in the project which aims to use Web 2.0 and social software tools for people to learn about politics. Although the subject is great there are as ever problems. How can we get young (and not so young) people to communicate between different cultures and different languages. Some of the partners are schools or working in the school and vocational learning sectors. As such the teachers are using the politics resources and (under development) platform to scaffold learning for young people. Other partners, like Pontydysgu, wish to develop the platform and tools for self directed learning by young people. Is it possibel to develop resources, tools and an overall platform which can cater for such different approaches to learning. In some ways it is more difficult to develop the platform for self directed learning, as the resources and platform need to at least assist in scaffolding the learning. And despite progress in such areas as recommender systems and the provision for supporting peer based learning, I think our understanding of how to use technologies for scaffolding learning is still inits early stages. Anyway, and changing the subject, yesterday morning we moved the workshop to the Wales Assembly, where we met our Regional assembly Member, Leanne Wood and went for a tour of the Assembly. It was a surprisingly good experience in allowing an international group of project partners to relate the work we are doing on education to the broader field of politics as a whole. And I was impressed by the Assembly building. None of that old fashioned privilege and tradition associated with Westminster. Instead it is a modern, energy efficient building (no need for artificial lighting and heated through geo-thermal energy), based on the idea of transparency. Young people were wandering around, interviewing the First Minister for a BBC programme. The sun may have helped to provide a feeling of hope, starkly contrasting to the gloom an despair t5ha Westminster politic engenders today. Anyway that was the first three days of this week. If you were at the meeting, please feel free to add your comments on what you thought about our work together and the visit to the Wales Assembly. Last night I spent a hour or so playing with new social software startup, Lanyrd. And I love it. Why? Hi there! we have had a look at conferences your friends on twitter are going to, perhaps you might like to go too. And indeed, apart from the lack of time I might well want to go. So the site is already personalised for me based on the ideas and knowledge of my friends. Pretty good. But more important is the site is useful to me: it contains information and knowledge and links to people which will and already does form an integral and useful part of my work practice. In other words, it makes my work easier. That is because it is based on the artefacts and practice of my community of practice, of the people like me who work in technology enhanced learning, knowledge development and teaching and learning. This isn’t a friends site for everyone – of you do not go to conferences then Lanyrd offers little to you. But this surely has to be the future of social software.of niche sites based on the practices, concerns and artefacts of particular communities of practice. Other things I liked. The site is very open. Anyone is free to add and edit on the wikipedia shared knowledge principle. And the FA (not a TOSS( says anyone is free to scrape the site and get information out in any way they wish. Obviously on a roll, developers Simon Willison and Natalie Downe are rapidly adding more features allowing the use of the site to accumulate the outcomes of conferences, be they papers, videos, presentations or other artefacts. Once more they are building the site around the practices and artefacts of the research community. And finally the site is simple and intuitive to use and attractively designed. A lot of thought (and code) has gone into making it easy to use – for instance the ability to cut and stick from Open Office (or Office)without inserting any horrible formatting code. What are the drawbacks? The major weakness is base don its very strength. The site relies on your Twitter friends for its recommendations. And by no means all – or even a majority – of the research community are on Twitter, especially outside technology focused subject areas. Even the Educa Online Berlin conference, for just the kind of people you would think would be attracted to Lanyrd, has only 16 attendees signed up, despite there being some 2000 delegates enrolled for the conference. But it is early days yet. Lanyrd was only launched in August. And I can see that in a few months it will become an essential tool in our community – especially when they launch the API to the site. This has got me thinking about design – how can we capture the practices of other communities – particularly in relation to work and learning and design social applications around other aspects of their practice. I think one big lesson from Lanyrd is that more is not, always better. Lanyrd does not try to do everything for researchers bu8t takes am (important) part of their practice and does it better. I have just been looking at an interesting report, ‘Student perspectives on technology – demand, perceptions and training needs‘, (PDF) produced by the UK National Union of Students for the Higher Education Funding Council’ (via Josie Fraser on Twitter). 72.8% of respondents used ICT for both fun and for their studies, and 43.3% preferred to use a combination of both printed and electronic resources for their work. 90.1% agreed that the internet has benefited their studies. As to whether ICT has improved their learning experiences, 77.7% agree versus only 5.2% in disagreement. ICT skills – 81% agreed that their ICT skills were self-taught, with 88.6% agreeing that they were effective online researchers. Opinion was divided over whether mobile phones or PDAs should be used to assist learning – 37.3% agree, 35.4% disagree and 27.4% remain neutral. 42.9% would like academics and teachers to use ICT more. There was a common request for more skills training, particularly around how to effectively research and reference reliable online resources. Students are concerned about the ICT competency of lecturers and academic staff – There are varying levels of ICT competence on the part of lecturers and staff and, whilst some are clearly skilled or at least able to function in an IT setting, others lack even the most rudimentary IT skills; 21% of students thought their lecturers needed additional training. Opinions are fundamentally divided over e-learning, especially taking into consideration course type and exposure to ICT – both significant advantages and disadvantages were raised in all of the qualitative research with the students. ICT and career development requirements for teaching staff- ICT skills and usage in learning and teaching should be integrated into the UK Professional Standards Framework, institutional promotional criteria and selection for teaching awards. Institutions may also wish to consider whether staff could be paid or given time off to attend ICT training so that it is not seen as an added burden. Do you love books or do you love reading? At this years Alt-C session I went along to a session presented by James Clay entitled ‘Do you love books or do you love reading?’. James demonstrated several e-book readers and went on to speculate on the potential of e-books in education. It was the first time I have actually got my hands on an e-book reader and I liked it! So when Amazon updated the Kindle I got myself one. Now the kindle, despite the neat leather covers which try to make it look like a book, is not the same thing. If you like the appearance of your book collection on your shelf it is going to do nothing for you. But if on the other hand you like reading the Kindle is brilliant, especially if you travel a lot. I can see the e-book revolutionising education. Readers are already relatively cheap and will only fall in price. they are highly portable and e-paper can be read in bright sunlight. e-Books could be another step in taking learning outside the classroom. If open educatio0nal resources were provided in an e-book format we could provide learners with most of the materials they need to follow a course. However, I have two provisos. The up-market Kindle comes with free G3 connectivity. However, ignoring the rather difficult to use Webkeit browser, Ok if you have nothing else but not really7 a great browsing experience, the only thing the Kindle connects to is the Amazon store. To get other materials onto the kindle you have link it up to a computer. And although it will display PDFs they do not always seem to be formatted right for the Kindle. I am still messing with this and would be grateful to hear from others’ experiences. I also must have a go at converting documents into e-Pub and transferring these ot the Kindle. Amazon will convert PDF, word and Open Office documents and put them on your Kindle, but they charge for that service. The third issue of course is Digital Rights Management. It is not as easy to give away or share an Amazon e-book as it is a traditional paper copy. My second reservation is that merely making documents available returns us back to passive consumption of learning materials,. But there seems plenty of potential for more interactive reading, as has been shown by a number of iPad apps. My feeling is that the e-Book is here to stay. And I also think it may transform education. But we need to think through the pedagogic process and potential of using e-Books and need to experiment with standards and formats. I love books. But I love reading even more! What do you think?